Sharp-eyed readers will have already noticed a new addition to the column to the right: yes, there's a NEW cover added to the mix, meaning that there's a new book making its way towards publication. 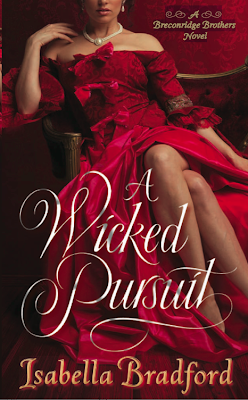 Published by Ballantine/Random House, A WICKED PURSUIT is the first book in my new trilogy of Georgian historical romances featuring the three sons of the Duke of Breconridge – young gentlemen who briefly appeared in my last book, WHEN THE DUKE FOUND LOVE. Now older and a good deal more experienced, the three noble brothers are about to do the unthinkable: settle down and marry. Harry Fitzroy, Earl of Hargreave, is the first to meet his match and lose his heart...to Lady Augusta Wetherby, a lady who's not at all what Harry (or anyone else) expected. A WICKED PURSUIT will be released in late February, 2014, in both paperback and ebook formats, and it's already available for pre-order at both Amazon and Barnes & Noble. And fear not, British readers: once again my books will be published at the same time in the UK, Australia, & New Zealand by Eternal Romance. For more about this book in the coming months, click here for my Facebook page - and I'd be most grateful for a "like" as well while you're there.